Demolition Pro USA is willingly passionate to provide safe demolition services to our clients as per their needs and demand. 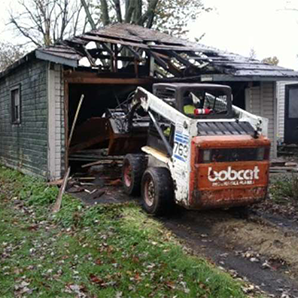 Alongside with residential and commercial sector, land leveling, pool demolition, and concrete background, we are also working closely with garage demolition. Demolition of a garage is also accomplished via trained professionals. We approach it systematically as we work from the top down technique, and keep the framing standing as much as possible. The reason behind this technique is to keep a safer environment for everyone. ​Organization and disposing of debris is another keen perspective of garage demolition. Some of the materials are recyclable and have proper value. The safety is implied for providing highest standard of services to our valued clients. With each project, we also endeavor to minimize waste by maintaining a higher volume of recycling. Therefore, Demolition Pro USA is working in the market with its complete potential for serving the commercial clients in terms of demolition..